Since even before Trump’s election, immigration has been one of the most contentious topics of law in the public eye. Since the election of Trump, that contentiousness has spilled out into a battle between the Federal government and state and local governments as these governments resist allowing the hand of the fed into their own approach to immigration. Certain cities have drawn Trump’s ire more than any others. These so-called sanctuary cities such as San Francisco and Los Angeles have been on the receiving end of particularly vicious tweets and public commentary from Trump for their comparatively lax approach to immigration law and refusal to cooperate with the expanded powers of Immigration and Customs Enforcement (ICE) Agents under the Trump administration. This ire has also included an executive order from back in April pulling federal funding which was subsequently blocked in the courts until both the definition of “sanctuary city” and the amount of funding to be withdrawn was substantially limited. The bill has yet to pass through the Senate, although the Republican majority there makes its passage very likely. However, it’s important to note that it is still a bill and not yet a law. But the act itself is so likely to pass that it’s worth preparing for its implications and near certain legal backlash. The primary effect of the “No Sanctuary for Criminals Act,” despite the name’s implication that it impacts specific criminals, is to target “sanctuary cities” with substantial funding hits. The law essentially sanctions any city who refuses to turn over people to ICE or jail people on behalf of federal authorities. It similarly sanctions cities that won’t comply with ICE actions of any type—requests to hold suspected undocumented immigrants and the like. 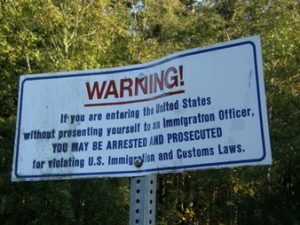 Specifically, the bill makes it so that jurisdictions which fall out of line become ineligible to receive any funds under the Immigration and Nationality Act, the “Cops on the Beat” program, the Omnibus Crime Control and Safe Streets Act and any other grant from the Department of Justice or Homeland Security that is substantially related to law enforcement, terrorism, national security, immigration, or naturalization. This is a potentially enormous amount of money to pull from these jurisdictions. Under the bill, this money would be redistributed to jurisdictions in compliance with the Act. However, just like the executive order before it, the bill has received substantial criticism as to its constitutionality which will likely culminate in a lawsuit should it pass the Senate. The majority of the concerns voiced over the NSCA are in regard to the 10th Amendment. The text of the10th Amendment reserves all rights not given to the Federal government under the constitution for the states. However, as part of the implications of this, it also prevents the Federal government from compelling the states or their agents to action unless they specifically have the power to do so under the Constitution. This rarely comes up in a modern context and the Supreme Court have become more and more reticent about limiting federal action on 10th Amendment grounds. However, they have done so several times in the past several decades. For instance, in 1998 they ruled a law unconstitutional where it required state and local law enforcement to conduct background checks on those trying to buy handguns. The law amounted to the federal government forcing state participation in a program and was thus ruled unconstitutional. This isn’t much of an issue for the “No Sanctuary for Criminals Act.” It doesn’t so much command the states or their jurisdictions to act so much as pull the funding rug out from underneath them if they don’t. This can cause its own constitutional problems however in terms of how the federal government may handle funding. The federal government generally has the power to distribute funds as it sees fit. However, when funding provisions are so draconian as to be coercive they are unconstitutional. This has most recently come up in the context of the Affordable Care Act in 2012 with the Supreme Court ruling that the funds pulled from states refusing to participate represented a “gun to the head” of the states. The funding conditions must not be coercive. The first three elements aren’t really an issue here. The clarity of the act isn’t really an issue and they’ve made a clear point of trying to limit the funding cuts to areas that could be considered related to immigration and national security. But the breadth of the cuts themselves will likely become contentious if the bill becomes a law as states seek to limit the bill to only strictly related funding sources. The fourth element is interesting and will likely be a source of a great deal of future litigation. The ACLU has voiced concerns that the bill could demand cities to act in violation of the 4th Amendment by requiring local law enforcement to hold people without due process or probable cause when directed to by the federal government. However, it is the last element, coerciveness, which has been the target of most of the conversation when it comes to the constitutionality of the NSCA. This is partially because what exactly makes a spending provision coercive under the law is a bit hard to nail down. The most obvious element of coerciveness is just how much money is in question. The exact amount necessary has ranged substantially from case to case. In some cases, the amount to be pulled by the NSCA might qualify, in others far more is necessary. The ACA case has implied that the amount is not the only consideration however. Where a state or jurisdiction has grown to rely on a source of funding, that likely factors into whether pulling that funding is coercive. It also makes a funding provision more coercive if a new program is put in place and funding from a more established federal program requires involvement in this new program. The NSCA may run afoul of this somewhat due to the many older programs it denies funding from where jurisdictions fail to follow the provisions of their new program. So, are the funding provisions of the NSCA unconstitutionally coercive? Unfortunately, the answer is an unhelpful maybe. There are certainly some elements that point in that direction and a large portion of the determination will come down to exactly how much money a given jurisdiction stands to lose. However, coerciveness is a poorly defined, heavily fact-specific legal concept. It’s just impossible to reasonably say one way or another. However, will there be lawsuits challenging the constitutionality of the NSCA if it passes the Senate? Yes, absolutely. However, for now the NSCA is just a bill. Until it becomes a true law, we can expect that the many critics of the spending provisions will stick to making themselves heard in the public and not yet in the court.